Developments surrounding the recent G-20 summit further underlined some starkly conflicting views among key global policymakers, an important “American-German divide” in matters of macroeconomic policy in particular. For instance, referring to the Federal Reserve’s latest quantitative easing (“QE2”) initiative, Germany’s finance minister Wolfgang Schäuble briskly attacked U.S. policy as “clueless” and “irresponsible”. In his view, it is inconsistent for the U.S. to accuse the Chinese of exchange rate manipulation while steering the “dollar exchange rate artificially lower with the help of their printing press”. While highlighting that the final remnants of global policy consensus at the G20 level have evaporated, Mr Schäuble is clearly missing the real inconsistencies in international policymaking today. Take Mr Schäuble’s assertion that Germany’s export success was not based on any exchange rate tricks, but on increased competitiveness. This would seem to imply that the euro’s decline from $1.50 to $1.20 in the context of Europe’s so-called “sovereign debt crisis” was neither a competitive depreciation nor any other kind of exchange rate trick, but a legitimate booster of German competitiveness; conveniently super-charging Germany’s export engine though. Rather less convenient, at least from the viewpoint of the rest of the world, is the fact that austerity across Europe will do little to boost German and European imports – when Europe happens to be the U.S.’s most important export market. 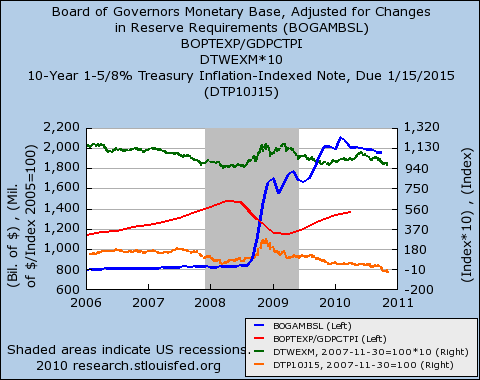 Does paying interest on reserves stall growth? In an interesting (pun intended) post (Economist’s View: Interest on Reserves and Inflation) Mark Thoma says that the Fed’s paying banks interest on their reserves does not dampen investment, for two reasons, one on the supply side and one on the demand side. On the supply side of the market for loans, Thoma points out that 0.25% (the rate the Fed is paying on reserves) isn’t that high. On the demand side, Thoma says that businesses have a lot of cash on hand that they’re not using to invest, meaning the demand for loans isn’t really there. I want to take issue with the second point, because while large corporations may indeed have a lot of cash on hand, small businesses and households don’t. And they are the ones who are being denied access to credit. This idea first occurred to me while I was in France in September. I marveled that the debate they’re having (complete with effective social mobilization), is about raising the retirement age to 62. The current Social Security retirement age is 67, and the ‘serious’ proposal from Bowles-Simpson is to index it to life expectancy. This proposal sounds reasonable. But life expectancy, like income, is unevenly distributed. As Paul Krugman and Tom Tomorrow have both pointed out, life expectancy has been increasing much more rapidly for the well-off, not for the rest of the workforce. My proposal is to implement a progressively higher retirement age for low, middle, and high-income workers. If chosen well, the tiered retirement ages by themselves could eliminate the relatively small projected shortfall twenty-five years from now. When I have time, I plan to run some numbers, but I think that such a system could lower the retirement age for low-income workers. This proposal would allow more of those workers who do the back-breaking and health-damaging work of our society to retire while they still have some time to enjoy it. Of course, for most of the working poor, social security alone is unlikely to provide a comfortable retirement. But the point of this counter-proposal is simply to shift the burden of balancing the small imbalance in Social Security finance from those who can least afford to bear it, as the current proposal would do, to those who can. With the recent announcement of QE2 (quantitative easing 2), the Federal Reserve’s new round of long-maturity asset purchases, it is worth looking at some of the effects of QE1. In November 2008, the Fed announced large-scale purchases of mortgage-backed securities and debt issued by the GSEs. Its securities holdings began to climb sharply in early 2009. As shown in blue, the monetary base (a broad measure of the Fed’s liabilities) had already begun to rise several months earlier. New asset purchases for QE1 ended earlier this year. The effects of QE1 and the other stimulative policies adopted by the Fed since late 2008 will be debated for some time to come. But notably, the green line shows that a trade-weighted index of the dollar’s value against a basket of foreign currencies has declined quite a bit. Some world leaders are unhappy about this development, but it may have helped to spur real (inflation-adjusted) U.S. exports, shown in red. The orange line shows the yield on a 10-year inflation-indexed Treasury security, which can be used as a measure of the real interest rate. This rate has tumbled from well over 3.5 percent to negative levels. Some economists doubt that a monetary authority such as the Fed can succeed in reducing real long-term interest rates over a prolonged period, but this is a remarkably sustained trend. Notes: The interest rate series in the graph has been rescaled (actually, multiplied by 100), so that its movements can be seen more easily. The export series has been deflated to 2005 dollars, using a chain-weighted GDP price index. The exchange-rate series, which is the Fed’s index of the value of the dollar against the “major currencies,” is scaled so that the first observation equals 1000. 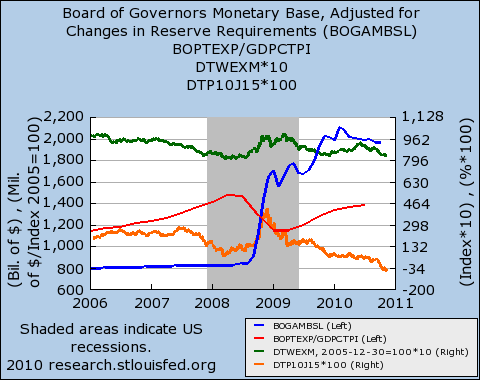 The monetary base is expressed in billions of dollars. Except for the exchange rate and interest rate series, all data shown in the figure have been seasonally adjusted. Detailed information on the Fed’s asset purchases and its balance sheet can be found in this series of official reports. In recent weeks, the explanation for the financial and economic crisis that has gripped the world economy has shifted sharply from deregulation and lack of governmental oversight of financial institutions to fraud and criminal activity. In truth, the US Federal Bureau of Investigation began to warn of an “epidemic” of mortgage fraud back in 2004, and my colleague Bill Black has been pointing to the role played by fraud since the crisis began. (See our recent two part series at www.huffingtonpost.com.) To be sure, there was ample fraud in the “pump-and-dump” schemes during the dot-com bubble at the end of the 1990s, which was closely followed by the commodities market speculative boom and bust. (See my article at http://www.levyinstitute.org/publications/?docid=1094. ) And before those episodes we had in quick succession the developing country debt crisis of the early 1980s, the US Saving and Loan fiasco of mid 1980s (with bank crises in many other nations), the Japanese meltdown and the Asian crisis, the Mexican peso crisis, Long Term Capital Management and Russian default, and the Enron affair. Seemingly, the crises have become more frequent and increasingly severe until almost the whole world was infected. It is obvious that there must be some link among these crises and that while fraud played a role in most or even all of them, it is not sufficient to lay blame on “bad apples”, bad policy, insufficient foresight, and outright stupidity. We must find a more comprehensive explanation. When the crisis began in the US in 2007, many commentators called it a “Minsky moment” or even “Minsky crisis”, after the late economist Hyman Minsky who had developed what he called a “financial instability hypothesis” over the years after 1960 and to his death in 1996. Minsky was my PhD dissertation advisor and I had already used his approach to analyze the Saving and Loan crisis. Unlike the typical explanation that invokes Minsky’s theories, I recognized that Minsky did not simply provide a “euphoric bubble” approach. Rather he argued that the transformation of the economy and especially its financial system from “robust” toward “fragility” took place over a very long span of time, indeed, over the entire postwar period. The increasingly frequent and severe crises, as well as the growth of fraud as practically normal business practice were a consequence of that transformation. Hence, we should not call this a Minsky moment or crisis but rather a Minsky half-century. Much of the world emerged from the Great Depression and World War II with a combination of institutions, regulations, financial practices, and memories that together encouraged relatively rapid economic growth, high employment, growing incomes, and growing confidence in our future. Private debt was low (mostly wiped out in the bankruptcies of the 1930s), government debt was high (war finance), and the financial system had been “simplified” (in Minsky’s terminology). Big Corporations mostly used retained profits to finance expenditures; Big Unions kept wages growing so that workers could spend out of income rather than relying on debt; Big Government had filled portfolios of banks and savers with safe government bonds. Finance was kept small, constrained, and relatively irrelevant. Besides, memories of the Great Depression discouraged lending as well as borrowing. Strict regulation—especially in the US—kept risky financial practices segregated outside commercial banking. Over time a complex combination of factors changed all that—memories faded, regulations were relaxed or financial institutions defeated them with innovations (including new types of instruments and institutions that took market share away from highly regulated banks). Private debt grew. Risky practices emerged. Financial crises resumed. However, the crises were contained by swift intervention of Big Government and the Big Bank (central bank)—that bailed-out institutions and prevented recessions from becoming sufficiently severe to eliminate the risky behavior. Relatively robust growth combined with stronger labor led to growth of pension funds and other private saving—money that needed to be invested to get high returns to support a private retirement system. Clever managers of that money developed increasingly esoteric and complex ways to make—and to lose—money. The age of what Minsky called “money manager capitalism” had arrived—a form that put finance first. And, importantly, this new capitalism took a global form—a new globalization of finance developed. Again for complex reasons, the interests of money managers did not coincide with those of Big Corporations and Big Unions—the “leveraged buy-out” was used to strip firms of assets, load them with debt, and bust their unions. Wages stopped growing; consumers relied on debt to maintain living standards. Globalized finance also helped to globalize production—with low wage workers in developing nations helping to depress incomes in developed nations. Thus, “financialization” of the economies concurrently meant both “globalization” as well as rising inequality. The weight of finance moved away from institutions—that were guided by a culture of developing relations with customers—toward “markets” (the “originate to distribute” model of securitizing pools of mortgages is a good example). This virtually eliminated underwriting (assessing credit worthiness of customers) and also favored the “short view” (immediate profits) of traders (you are only as good as your last trade) over the long view of financial institutions that hold loans. In addition, the philosophy of “maximization of total shareholder returns” as well as the transition away from partnerships in investment banking toward public holdings promoted pump and dump schemes to increase the value of stock options that rewarded CEOs and traders. A “trader mentality” triumphed, that encouraged practices based on the “zero sum” approach: in every trade there is a winner and a loser. As practiced, the bank would be the winner and the customer would be duped. This transformation helps to explain why fraud became rampant as normal business practice. Competition among traders and top management to beat average returns led to ever lower underwriting standards to increase the volume of trades—with fees booked on each one—and with strong incentives to “cook the books” (record false accounting profits). Once accounting fraud is underway, there is a strong incentive to engage in ever more audacious fraud to cover the previous crimes. In the end, the US financial system (and perhaps many others) became nothing but a massive criminal conspiracy to defraud borrowers (through such instruments as “liar’s loans”, NINJAS—no income, no job, no assets, no problem!—and “no doc” loans) as well as investors in securitized products (mortgage backed securities, collateralized debt obligations that were securities of the worst MBSs, and on to CDOs squared and cubed). All of this led to layering and leveraging of debt on debt and debt on income. At the peak, US indebtedness was five times national income—meaning each dollar of income was pre-committed to service five dollars of debt! This was, of course, impossible. The pyramid of debt collapsed like a house of cards. Where are we now? Many governments reacted with fiscal stimulus packages as well as bail-outs of financial systems. While many have proclaimed that the worst is behind, by all objective measures, nearing the end of 2010 the financial system is probably in worse shape than it was at the end of 2007 when it collapsed. Debt ratios have not come down appreciably. Defaults and delinquencies are up by huge amounts. In the US foreclosures have come to a virtual standstill as it has been recognized that many or perhaps most foreclosures that have taken place were almost certainly illegal. Holders of securitized products like MBSs and CDOs have begun to sue banks for fraud, demanding they take them back. While banks have reported strong earnings, almost all of these have been in trading activity or have resulted from reducing loss reserves (ironically, as defaults rise). In other words, none of the normal bank activity is generating revenue—all profits are accounting profits where it is easy to “cook the books”. Where it will all end is unknown but a complete collapse of the financial system is not out of the question. This time around, it is not clear that governments will save the banks–having been burned last time around, voters are not sympathetic. Especially in the US the feeling is that Main Street’s needs have been ignored while Wall Street has been favored. And in most nations, government has adopted austerity policies to reduce spending and where possible to raise taxes. In some countries this appears to be necessary—such as the so-called “PIIGS” (Portugal, Ireland, Italy, Greece, Spain) that are heavily indebted with hands tied due to constraints imposed by the currency union. In others, such as the UK and the US it is mostly political—a reaction against the bail-outs of financial institutions. How this will all turn-out I do not know, but another crash and even deeper downturn seems likely. I’ve emerged this morning to report on some of what’s transpired recently. I’m not referring to whatever might have happened yesterday and overnight at major centers of research in neoclassical macroeconomics, such as the University of Minnesota. I’m referring to a new book by John Quiggin entitled Zombie Economics: How Dead Ideas Still Walk Among Us, which was published late last week by Princeton University Press. While this book is not meant to be on the cutting edge of research, it will hopefully help to bring popular discussion of mainstream macroeconomics and its foibles up to date, adopting a welcome skeptical attitude to this controversial subject. Some of the best previous critical work about the New Classical school of macroeconomics has been done by Esther-Mirjam Sent, who wrote The Evolving Rationality of Rational Expectations: An Assessment of Thomas Sargent’s Achievements (Cambridge University Press 1998, paperback 2008). This book is far more technical than the new one by Quiggin, and is largely a case study in the history of economics. (By the way, Quiggin’s book also contains some arguments about academic economics that might be tough going for a reader who has not taken at least one or two economics courses.) Few interesting and accessible discussions like this new one exist for those who just need an entertaining introduction to the main new orthodox approach to macroeconomics that has emerged during the past 30 or 40 years. The theories covered in the book are now accepted by many antagonists of the New Classical school, including some who style themselves as Keynesians. Zombie Economics has some especially interesting discussions of the author’s own research (some of it coauthored with Simon Grant) on the privatization of government programs from the perspective of public-sector economics and especially public finance. This topic may be important next year as debate begins in earnest over proposals to be considered by the new Congress. Quiggin’s critique of the case for privatization also touches on the “equity-premium puzzle,” an important topic in finance, as well as claims about the social costs of the business cycle, which Robert Lucas and many other economists believe to be negligible. The book also has some interesting observations on economic inequality, the Efficient Markets Hypothesis, and other matters relevant to the Great Recession, the housing bubble, and the financial crisis. There has been a bit of a barrage of articles and columns arguing that recent macroeconomic ideas are largely to blame for policy mistakes that led to the 2007–08 financial crisis. The book argues effectively in favor of this thesis, but it also provides a broader and deeper perspective on exactly what the various theories are than is available in most of the mainstream media. When it comes to providing a better understanding of the financial crisis, Quiggin is a fan of behavioral economics, as well as the late Hyman Minsky, who was mentioned in our last post. There are a few gaffes in the book, and I have some differences of opinion with the book’s arguments on economics and public policy. This makes me hesitant to recommend the book unconditionally, but the book’s flaws are minor and will probably not be important for most potential readers. I am glad that I read Zombie Economics, and I found much to learn from in it, despite the fact that I have done much research in macroeconomics from a critical perspective. Of course, the books discussed above are available at the usual booksellers and perhaps your local library.